The CGIAR Genebank Platform led by the Crop Trust, enables CGIAR genebanks to fulfill their legal obligation to conserve and make available accessions of crops and trees on behalf of the global community under the International Treaty on Plant Genetic Resources for Food and Agriculture. Through the Platform, CGIAR genebanks safeguard a unique global resource of crop and tree diversity and respond to thousands of requests for germplasm from users in more than 100 countries worldwide every year. The CGIAR genebanks and germplasm health units (GHU) employ more than 400 skilled staff to monitor, test, germinate, multiply, characterize, clean, culture, store, and distribute germplasm under high scientific standards of operation, and to deal with individual requests for crop diversity from users worldwide as well as within the CGIAR. Platform, the genebanks ensure the increased conservation and use of the collections they manage in the framework of an improved and supportive policy environment. New technologies, knowledge and processes offer the possibility of further raising standards to become more ecient and more effective. The genebanks must work strategically to exploit new opportunities, conserve more diversity and respond to more demands while controlling costs. The genebanks must align their operations towards more targeted use and exploitation of the collections. This they can do by enriching the data associated with them. In particular, genebanks should exploit the tools and data resulting from the large-scale genotyping and phenotyping initiatives of the AFS CRPs and other CGIAR Platforms. CGIAR’s acquisition, development and dissemination of genetic resources and data are directly affected by international agreements. CGIAR must proactively engage in the development of these processes to ensure that they create a supportive policy environment for CGIAR genebanks, breeding programs and national partners. CGIAR genebanks germplasm distribution from 2012 to 2017 (countries shaded in yellow) and genebank locations. 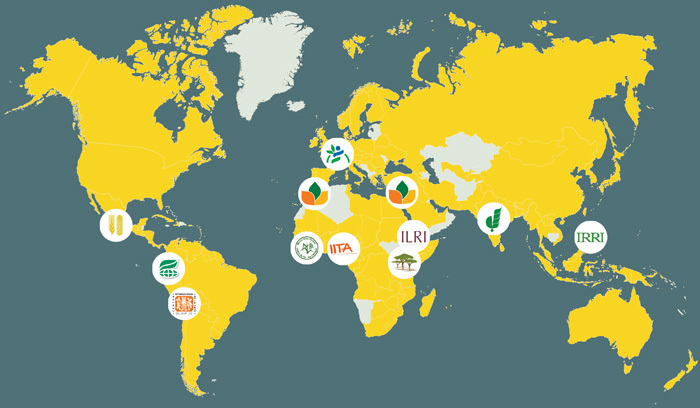 The 11 CGIAR genebanks are strategically located in centers of crop diversity, which ensures that germplasm acquisitions and distributions are comprehensively global, with a diverse partner and user base. Distribution figures reported from the genebanks since 2012 illustrate that every genebank has a truly global outreach. uses and the users are highly diverse and differ among crops and geographical regions. To illustrate the contribution of the genebanks to increased crop productivity, IRRI reported in 2012 that the 12 most popular IRRI genebank accessions have been used in more than 1000 breeding crosses each, and of 4317 released rice varieties, 90% of the non-IRRI varieties and 100% of the IRRI varieties had at least one accession from the genebank in its pedigree. Similarly, a study of the use of the CIAT genebank revealed that 60% of the 411 bean varieties released since 1976 contain material from CIAT’s collection. There is a reasonable basis to expect increased demand for germplasm. Present-day technologies for disease indexing, high-throughput sequencing and phenotyping and screening data have the potential to create a dramatic increase in value and demand for diversity. Most Centres report an overall increase in distribution in recent years and, given a supportive policy framework and strong phytosanitary controls, this can be expected to continue. The annual rate of distribution between 1985 and 2009 for nine CGIAR genebanks was 39,970 samples. Between 2012 and 2014, the same nine genebanks reported an annual average distribution of 91,973 samples. 90% of accessions are healthy and available for immediate distribution. The Genebank Platform ensures that the day-to-day operations of the genebanks are fully supported and compliant with international standards and policy, and that modern-day technologies and opportunities are exploited to ensure effective access and use of crop and tree diversity for the benefit of all.